The Serbian parliament MPs on April 23 elected Maja Gojkovic, a member of the Serbian Progressive Party Presidency, as parliament speaker. She was backed by 194 MPs, 14 were against, while nine abstained from voting. Gojkovic said that she would persevere in facilitating the equal rights and responsibilities of all MPs, regardless of whether they were from the ruling coalition or the opposition. In her first address to the parliament in her capacity as speaker, Gojkovic said it was a great privilege to be "the first among equals", but that it was also a huge responsibility. Gojkovic added that her goals were no different from those of her predecessors, which were primarily to promote democracy in the Serbian parliament and a spirit of tolerance. "I take this opportunity to pledge that I will persevere in facilitating the equal rights and obligations of all MPs, regardless of whether they belong to the ruling majority or the opposition. The image of the parliament cannot be created by one person, but by all of you who will be working with me", she said. According to Gojkovic's CV delivered to MPs and reporters, she was born in Novi Sad on May 22, 1963, graduated from the Novi Sad Law School in 1987 and passed her bar exam, two years later. Gojkovic has been active in parliamentary life since 1992. She was an alderman in the Vojvodina assembly from 1996 to 2000, a minister without portfolio from 1998 to 1999 and the Yugoslav deputy prime minister from 1999 to 2000. 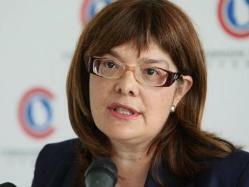 In the 2004 local elections, she was elected Novi Sad mayor. Gojkovic was a member of the Serbian Radical Party since its foundation in February 1991 until March 2008, when she was excluded from the party. In October 2008, she founded the People's Party. In May 2010, the People's Party joined the United Regions of Serbia, from which it was excluded on June 26, 2012. Several months later, the People's Party joined with the Progressives, with Gojkovic becoming a member of the party's Presidency.